On Friday, June 1st, join SELECT as we gather for the next Social Night - a series of cocktail and networking events designed for Members to mix and mingle. 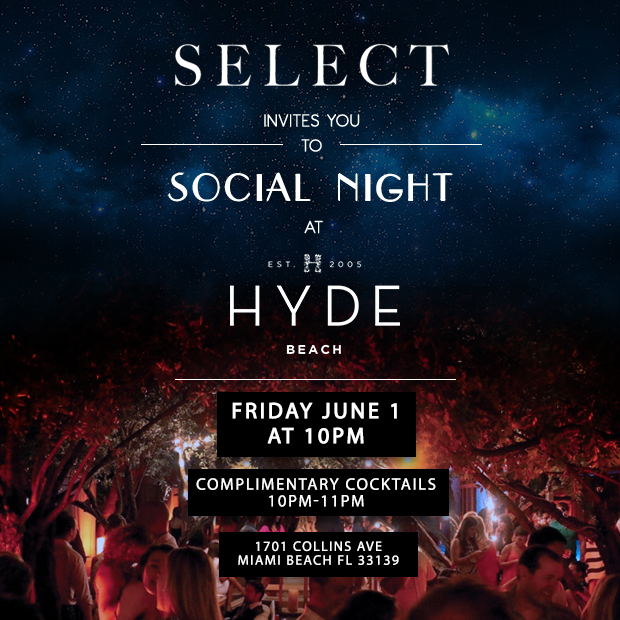 This installment we will be returning to the scene of several debaucherous SELECT soirées at the stylish SELECT Partner Hyde Beach, where we'll enjoy one hour of complimentary SELECT Specialty Cocktails, warm company, and chic vibes. This Social Night follows the last incredible SELECT gathering at Wall Lounge and is surely not one to miss. This event is complimentary for Members and one preferred guest with additional guest tickets available for $15 each.